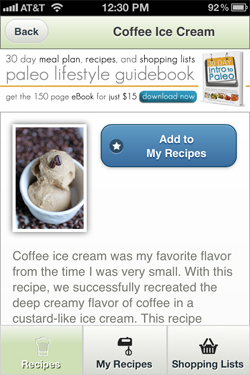 More Paleo posts! Sorry – there’s just so much cool stuff coming out now that I can’t help but share what I find. 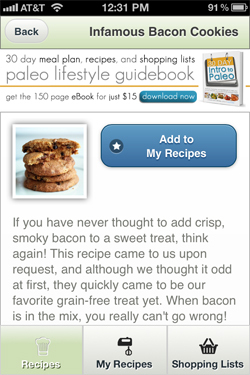 “Make It Paleo” is one of my favorite new Paleo cookbooks that has recently been published, and the authors have just launched a FREE mobile app called myKitchen to access their FREE library of great recipes and tools for the Primal palate. Ha – in fact, that’s what their website‘s called. 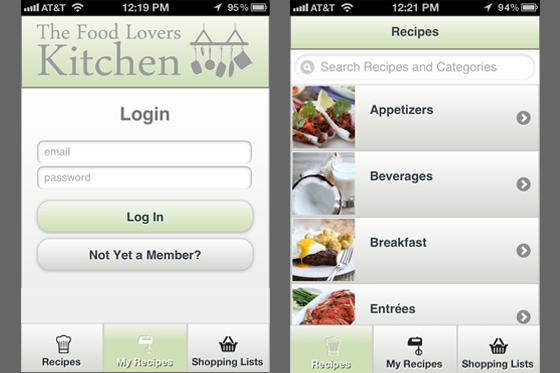 Anyway, I just discovered myKitchen today and downloaded it. It’s pretty darn cool. 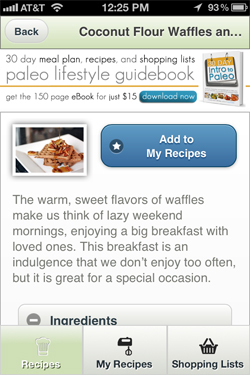 There are recipes for delicious treats like waffles (something I thought you’d have to give up to eat Paleo!) – and look at the photographs! 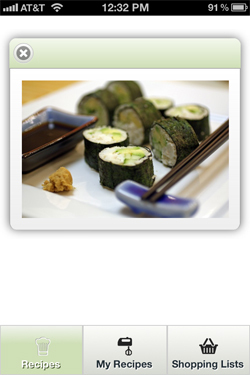 And rice-free sushi. So rad!!! 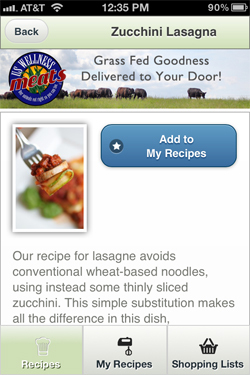 Here’s one of Nick’s favorites – lasagna – made with zucchini noodles. Even if you didn’t subscribe to the Paleo philosophy, you can’t deny that replacing flour noodles for ones made with zucchini are going to be more nutrient dense. 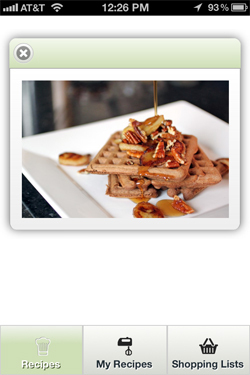 And seriously, I never got used to those “whole wheat” noodles … blech. 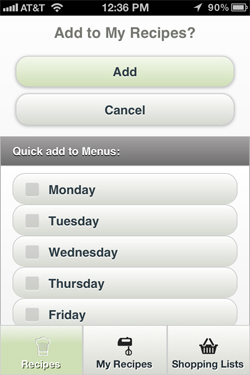 So when you find recipes you like, you just click “Add to My Recipes”, and then you can add specific recipes to certain days of the week to plan your week’s menu out! 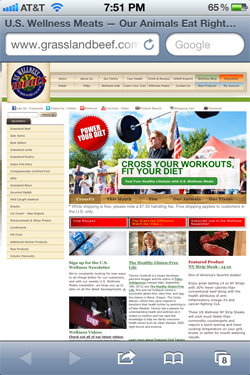 You need to sign up for an account with the their site, but it’s free, and while they do have their own newsletter, they really don’t spam you. Awesome. 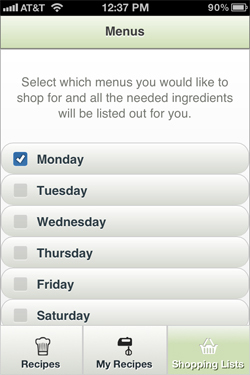 From your daily/weekly menus, you can also generate shopping lists! So great! 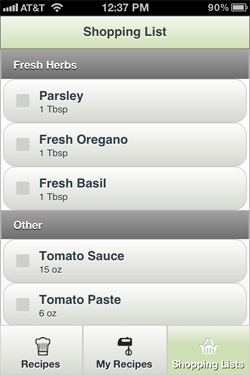 I put the Zucchini Lasagna recipe in my recipes and set it for Monday. Here’s my shopping list! 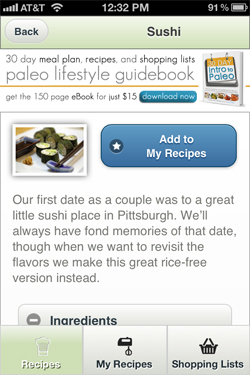 Since this is a free app, there are of course ads (you might have noticed the banners in the pictures above), but they’re just for the Primal Palate’s site/products and their partner US Wellness Meats, which is a great source for grass-fed beef and other quality pastured meats, which can be hard to find right now! This is SUCH a cool app and I’m glad I found it. 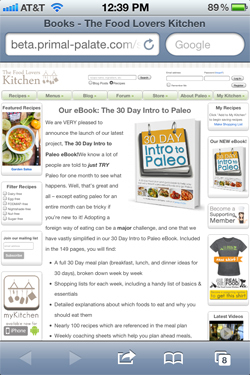 As I said before, there are some good Paleo and Primal cookbooks coming out right now, but it’s still gaining momentum. Any resources I can find (especially ones with this high a production quality – and for free!) are SO valuable. Thanks, Bill & Hayley! Thanks for the info. I can’t get into the whole wheat noodles either!